I finished my Crosses and Losses quilt yesterday (finally)! When I stitch on the last of the binding, I looked at the weather for the next day and saw that it was going to be 60 degrees...in February...in Chicago! Perfect for quilt photos, amiright? Of course I neglected to take into account the 25 mile per hour winds and the great snow melt, which meant sinking into an inch of mud. By some miracle, the quilt did *not* blow off the barn and into the messiness. This quilt is for my daughter, and she chose a hot pink minky for the back. Pretty much, unless it's a summertime bed quilt, my kids will pick a minky backing 100% of the time. My husband too. I get a lot of comments and emails about how to baste and quilt with minky. I know it can be stretchy and messy and slippery. I use the same basting technique (tutorial here) that I use with all my other quilts and have great success. I really love the low volume scrappy background paired with the bright colors. Cutting out the fabrics when I go this scrappy does take longer, but I think the effort is very well worth it in the end. 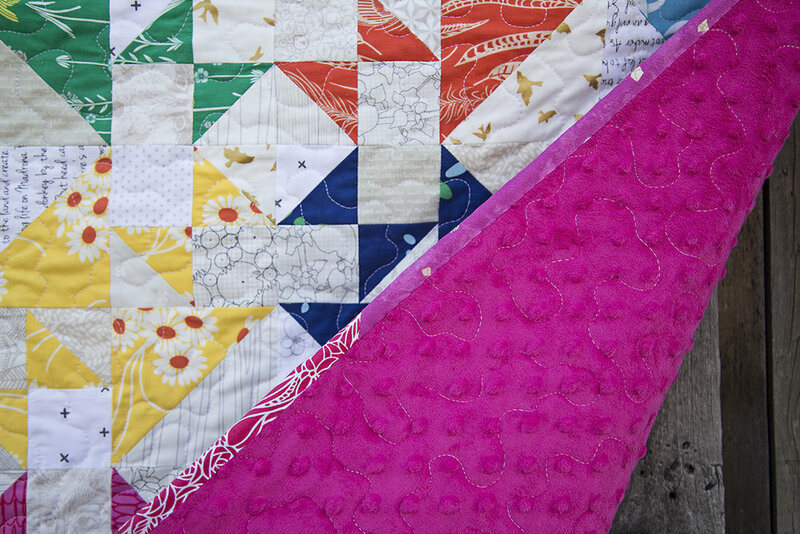 The binding is a scrappy assortment of pinks. For the quilting, I decided on a wider spaced meandering than usual. I wanted the quilt to be super cozy and have a nice drape. The final quilt measures 56" x 48". Off to put it away in my daughter's room and let her be surprised when she gets home from school!